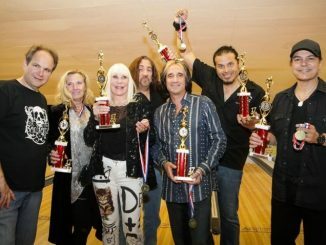 The fourth annual BOWL FOR RONNIE Celebrity Bowling Party, hosted by television and radio personality Eddie Trunk, will feature a celebrity bowling tournament and a raffle drawing for prizes and memorabilia. Last year’s event brought in $49,000 for the cancer charity, which is now in its ninth year of raising awareness and much-needed funding for cancer research. BOWL FOR RONNIE participants can anticipate an evening of fun, food, and, of course, bowling with rockers and celebrities competing for trophies in the name of raising funds and awareness for the Dio Cancer Fund. 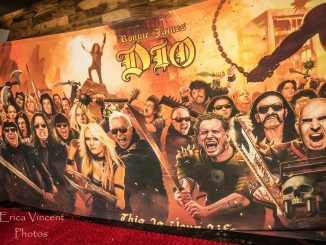 Among the raffle prizes will be a specially-designed bowling ball and pin featuring the BOWL FOR RONNIE artwork (see below). The event kicks off at 6:30 PM with open bowling and a VIP pre-party for lane sponsors, celebrities and their guests. 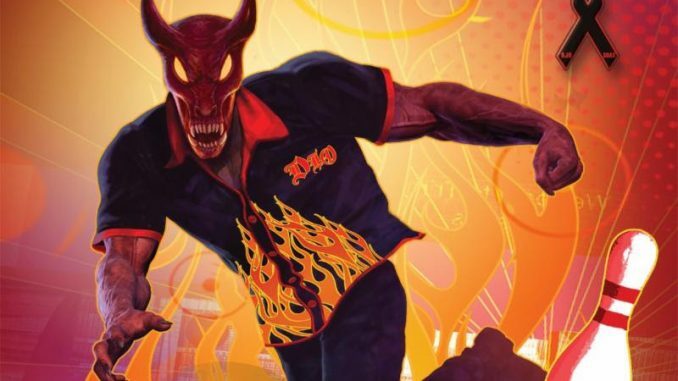 100% of the net proceeds from the BOWL FOR RONNIE will go to the Dio Cancer Fund (www.diocancerfund.org). Previous BOWL FOR RONNIE events have brought together entertainers and artists such asTom Morello (Prophets Of Rage & Rage Against The Machine), Sebastian Bach, Richie Sambora, John 5, Ahmet Zappa, Machine Head’s Phil Demmel, Grammy® Award winning duo Tenacious D featuring Jack Black and Kyle Gass, Steven Adler, Lita Ford, members ofTOOL, Mastodon, Black Star Riders, Stone Sour, Rough Cutt, Dio Disciples, and many more. This year’s celebrity bowlers will be announced shortly. The Ronnie James Dio Stand Up and Shout Cancer Fund was formed in memory of the legendary rock singer Ronnie James Dio, who lost his life to gastric cancer in 2010. A privately funded 501(c)(3) charity organization dedicated to cancer prevention, research and education, the Ronnie James Dio Stand Up and Shout Cancer Fund has already raised over $2 million in its short history. Monies raised have been committed to the cancer research work of the T. J. Martell Foundation for Cancer, AIDS and Leukemia Research, the gastric cancer research unit of the M.D. Anderson Cancer Center in Houston, where Ronnie was treated for gastric cancer during the last six months of his life, and other cancer research projects. The Dio Cancer Fund has committed funds to support the research of Dr. David Wong and his team at the UCLA School of Dentistry in developing a simple, non-invasive saliva test for the early detection of cancer, which is in keeping with the Fund’s mission of cancer prevention, research and education.